Violin rope binding, copied from a vintage German workshop fiddle. Pieces are approx. 8.5 cm long. white wood is maple, dark wood is ebonized walnut. * cut piece to length and to fit in with the remaining binding. * clamp. 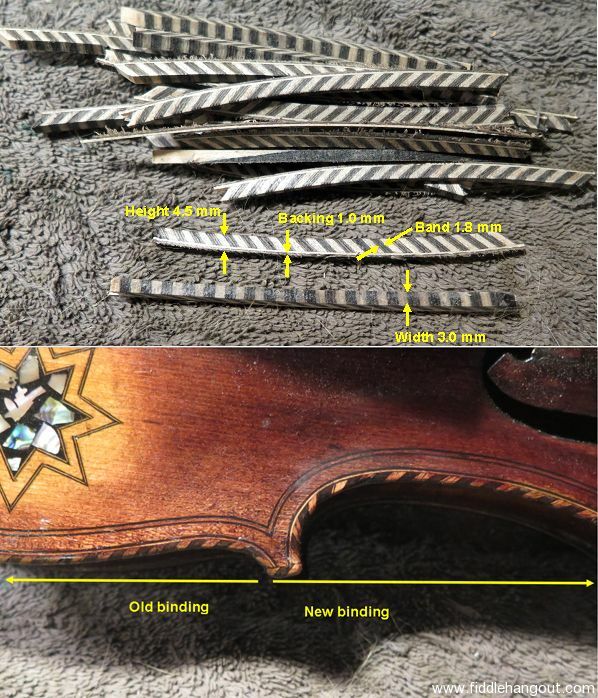 I usually wind several rubber bands around the binding & the body of the fiddle. If the wood strip is still wet & warm from the immersion, this usually corrects any separation of the bars). See comments for prices for multiple pieces. Returns accepted. Buyer must contact seller within 30 days to arrange return. Refund will be given as Money Back. Buyer pays return shipping. This ad will automatically expire 6/3/2019 2:42:15 AM unless updated before that date. To keep the system current, ads expire if not updated for more than 60 days.